Based on the following, I think the answer to question 2 should be b. Thanks Omar, agreed on that answer and update the same. Isn’t Metric name also mandatory? Doesn’t seem so the MetricData doesn’t seem to be a mandatory parameter. When I created ASG, the detailed monitoring is enabled by default. Can you double check? Thanks Jacky for the Correction, it is enabled by default when the ASG is created by CLI as targeted by the question. For ASG created from Console, by default, basic monitoring is enabled. Can you help me answering below question? 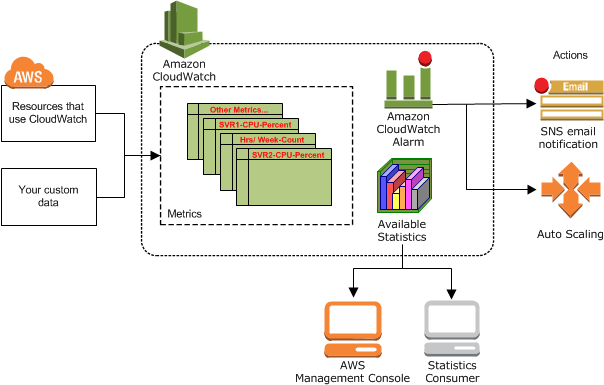 a user has created a launch configuration for auto scaling where cloudwatch detailed monitoring is disabled the user wants to now enable detailed monitoring. how can the user achieve this? The launch configuration once created cannot be updated, so the answer should be #D. You create a new launch configuration with detail monitoring enabled and then update the auto scaling group to use it. Hi Uma, as per my understanding the metrics are being pushed though CLI to CloudWatch it should be able to collect and agrregate them. In this below link it reads it cannot aggregate between regions but you can check the metrics on different instances in different regions. No, not sure where specifically in the document it says you can collect metrics from across the regions? Document only says can collect across instances. And Question to Jay – With CLI you metrics may be sent to cloud watch but should be with in the region and not across the region for cloudwatch itself. So, I think answer ‘a’ is correct? when sending custom metrics, i presume i can point to regional endpoint CloudWatch and send metrics and that should work. But I frankly haven’t tried so need to check does it allow or not. First of all, thank you very much for this resource. But you are saying CloudWatch does not aggregate data across regions. Can you clarify this? I am very confused. Hi Ugur, CloudWatch by default does not aggregate across region. However, when you are manually inserting custom metrics, I don’t see it a reason to aggregate the same. But I haven’t tried it frankly. Confirmed- if you send custom metrics to CloudWatch in 1 region from EC2 instances in different regions using the same namespace or dimension, you can aggregate the metrics in the CloudWatch console. Thats great Ryan, thanks for confirming the same …. Hi Jay, Thanks again for the material and the time you are putting into this blog. I followed your Solution architect associate one and passed by 916 score last week. THANK YOU. How can you even publish from an EC2 in one region to CloudWatch in different region. I don’t see any parameter in put-metric-data command to define the target region. Congrats fariemami, thats a great score. I remember check on the publishing metrics across regions before marking the option. Let me check the reference again. Isn’t A the correct answer as well ? Elastic Load Balancing is integrated with AWS CloudTrail, which captures APIs calls and delivers log files to an Amazon S3 bucket that you specify. There is no cost to use CloudTrail. However, the standard rates for Amazon S3 apply. The log files from CloudTrail contain event information in JSON format. An event record represents a single AWS API call and includes information about the requested action, such as the user that requested the action, the date and the time of the request, the request parameters, and the response elements. Here the question is to capture the client connection information which can be tracked using ELB access logs. CloudTrail would not help capture client connection, but only calls made to AWS API services using SDKs, CLI or Console and can be useful for auditing. I need your help in this question. In this question I am in doubt between A and D.
A user has configured an Auto Scaling group with ELB. The user has enabled detailed CloudWatch monitoring on Elastic Load balancing. Which of the below mentioned statements will help the user understand this functionality better? Monitoring done every minute is called detailed monitoring. Detailed monitoring is enabled by default on ELB and metrics will be sent to cloudwatch as long as traffic is flowing through the load balancer in that 1 minute. Hi Edivando, its A as ELB sends metrics at 1 min frequency with no charge. Data is available in 1-minute periods for an additional cost. To get this level of data, you must specifically enable it for the instance. For the instances where you’ve enabled detailed monitoring, you can also get aggregated data across groups of similar instances. Any reference as to what the statement is for ? Its supported which is correct. However, the questions ask for the actions not supported. If the query is regarding Q 9, it is already marked. 17. You have a high security requirement for your AWS accounts. What is the most rapid and sophisticated setup you can use to react to AWS API calls to your account? Would you explain why D? Considering that “Read-only APIs, such as those that begin with List, Get, or Describe are not supported by CloudWatch Events” and new still have to build a consumer for the kinesis stream. Isn’t the B a better choice? Thanks Farziemami, the solution is based on implementation @ https://aws.amazon.com/answers/account-management/real-time-insights-account-activity/. But B might also make sense. Let me check further. Thanks for all your efforts. It seems these questions are not updated since long time. Please update the question as per new format SOA-c01, if you have time. Thanks in advance. Yup Gaurav, in process of doing the same.